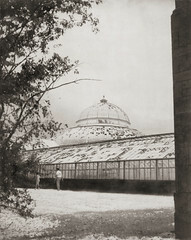 On June 23, 1962, golf ball-size hail rained down on the glass dome of Como Park’s Conservatory in St. Paul. Glass panels shattered sending shards falling on the visitors below who had sought shelter from the storm. By the end the Conservatory, built in 1915, looked like a war zone. The hail had damaged rare and valuable plants and the gardens were forced to close for the first time ever. After the storm, gardeners tending the injured plants were forced to wear protective helmets as glass pieces continued to fall. $75,000 in emergency funding had to be secured and the glass panels were replaced with fiberglass. The Conservatory re-opened four months later. By 1974 the constant sun and weather had clouded the fiberglass panels, depriving the plants below of sunlight. While the Conservatory was placed on the National Register of Historic Places that year, it was in desperate need of repair. It wasn’t until 1987 that major renovations to the Conservatory began, including replacing all the glass. Those renovations weren’t finished until 1992, 30 years after that hailstorm riddled holes in one of St. Paul’s greatest attractions.